Ferment Lab is a participatory space for food and social fermentation and is a current active and ongoing project of Pixelache Helsinki. It's latest iteration as international artist-residency project at Le Shadok fabrique du numérique, Strasbourg, France, has been ongoing since the beginning of 2017, and is currently in its closing stages. Other than the 2017 festival, Ferment Lab was one of Pixelache's largest project within the last year. This post gives an overview and gathers links to the various processes involved as a celebration of process-based, site & context specific, participatory bioarts or art-science experiments in relation to cultural heritage. Fermentation is a natural process that man has learned how to master. It is a crucial element to making foods and beverages in order to preserve it and enhance its taste and nutritional properties. In biochemical terms, it is a process that converts sugars present in foods, to acid, gazes or alcohol, under the action of ferments (such as bacteria, yeast, mold), most of the time in anaerobic (oxygen-deprived) conditions. Ferment Lab has taken various forms in its exploration of the phenomenon of fermentation. The project involves research and experimentation into food preparation as well as into social interpretations of the concept. Overall Ferment Lab aims to be conducted in various locations in order to collect parallel stories of food and social transformation, transplant gained recipes into other contexts and create new knowledge and meanings through experiments in social fermentation. The Ferment Lab Strasbourg process began in October 2016 when Nathalie Aubret, Agnieszka Pokrywka and Andrew Gryf Paterson met altogether with directrice Géraldine Farage and her the Shadok production team, to plan the implementation of a project proposal first designed in April of the same year. We were to be international artist-residents at Shadok during late February to early July 2017, and what we did there would give ideas or outcomes, an exhibition of process, artefacts and outgoings within the 'Strasbourg: Laboratoire à demain' (Laboratory of tomorrow) group exhibition at Shadok in 10th October 2017- 21st January 2018. Production and financial support came directly by Shadok's production budget, with partial travel support from Taike (Arts Promotion Centre Finland). Following pre-production visits in December 2016 and January 2017, making presentations and meeting local contacts who could be potential partners, the first public participation workshops took place in late February and early March. Since then the process has developed openly and organically according to who has turned up to the workshops and meetings, and what has followed through or not from that point onwards. Primarily we were interested to work with neighbourhood and special-interest food associations, as well as cultural associations focused on sharing cultural heritage, collaborative making and urban gardening. In late February and early March, the workgroup of Paterson, Pokrywka and Aubret hosted two DIY-DIWO-style workshops 'How to make Ferments' and 'How to make Ferment Lab'. 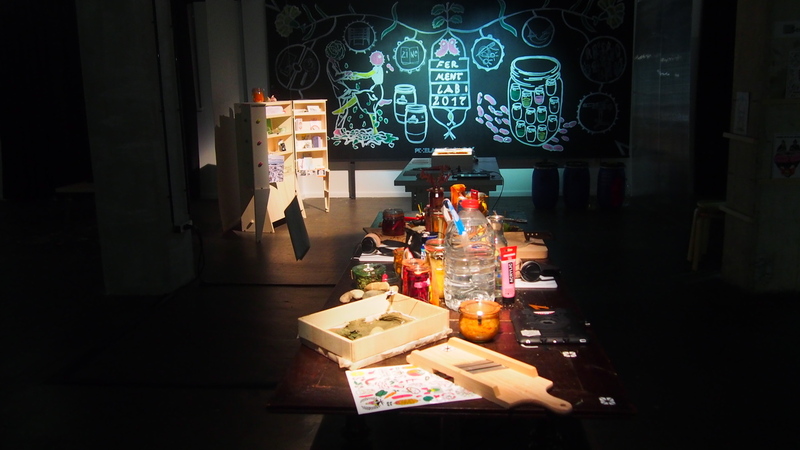 On the first occasion, participants were given demonstrations on how to make cabbage & saline-based ferments (Kimchi, Choucroute, Waste-vegetable pickles) with a participatory focus on making and sharing documentations in various formats. The second workshop was more 'meta', inviting the same and new participants to consider how to make a 'Ferment Lab' space which would be the public interface for the residency period, but also involved a degustation session tasting each other's ferments. One of the most enduring ideas that emerged from this session was a cabinet display, which the group commissioned local AV Lab maker Herve Munsch to make from digital fabrication (CNC router) method. The cabinet became a permanent feature from then onwards, and various tools, documentations, and ferment jars occupied our space in Shadok until late July. Herve was also our local collaborator who took up the 'Ferment Lab multipliers' challenge by hosting his own 'Fermentation and Visual Identity' workshop including use of fablab laser-cutter on two occasions in April 2017 (and January 2018 also). Paterson and Pokrywka returned to Strasbourg several times more during the experimental laboratory period. In late April they contributed to Shadok's 2nd anniversary celebration event with a ferment-themed participatory spectacle, at least that was the plan. They proposed a 'Krütt Trepple Dance Party' which took the traditional method of preparing cabbage for sauerkraut in large batches by stepping with bare feet, into a pop-up dance party outside Shadok. 100kg of cabbage was prepared, danced on, and crushed into soften mass to ferment in barrels over the year. Their ambitions to give it away for free were hampered, but collective work party fun was had in the process. They also returned in the summer season of late June and July, to undertake personal art-science experiments. Paterson continued his 'Bacterial Love Letters' process, inviting locals to experiment with edible paper for foraged or vegetable matter, and inks made from fermented berries. The poetic ambition was consider communications that might be made, gifted and received, ingested for mutual benefit for human and microbiome alike. Some progress was made in preparing edible plant based paper, but ink texture was not so satisfactory, so further experiments were necessary in December also. Pokrywka explored her curiosity in 'Bacterial Sensing', trying to find out ways to sense whether ferments are in a good state or not. This started in the summer with DIY pH testing, using red cabbage juice as an indicator in this common chemistry methodology. She also experimented with low-cost microscopes as a way towards seeing fements in alternative work-home environments. Using glass beads as a magnifying tool embedded in silicone was eventually presented as a take-away experience. If we were promoting the concept of social fermentation, all these activities were 'starter' encounters, where something may bubble and ferment into new actions in the future. However, there was also an expectation to present these processes in a 3 month group exhibition 'Strasbourg: Laboratoire de Demain' (Laboratory of tomorrow), with 3 stages of development. We installed an table with static and changing artefacts, tools and ingredients remaining from our process, with short audio vignettes (touch-interactive via Bare Conductive system) for the audience to listen to, telling stories about the different things we did, or what we used the item for. The installation also include larger items off the table that changed with each month, sharing some media or objects or research outcomes from our processes. According to feedback, we succeeded in telling about our process in absence, generating curiosity and strange encounters within a digital cultural centre, as well as promoting innovative cultural heritage interpretations and local food practices. As the Ferment Lab Strasbourg process has by its nature been site-specific, and many of our texts about it have been communicated in French, we decided to make an English-language zine which elaborates and opens up the project to an international reader and those who encounter the project for the first time after the exhibition is dismantled. A series of five zines have been designed and compiled by Agnieszka Pokrywka, including her own images and illustrations, as well as those of other participants, plus recipes and instructions. The first zine is an overview document, including project timeline, list of related projects, bibliography and comments on budget or work patterns. The second zine covers the workshops mentioned above; the third zine with photos from the Krütt Trepple Dance Party; while the fourth zine describes the 'personal art-science experiments' of Paterson and Pokrywka. Finally the last and fifth zine was released at the end of the exhibition period, including details about the artefacts exhibited, the ambition of the exhibition with feedback, and reflections on the whole process of Ferment Lab in Strasbourg. As a longer term legacy and reference for the Ferment Lab, all relevant media, illustrations, documentations and texts are shared on an Internet Archive account with open creative-commons licenses, so that our work is accessible and adaptable for future inspired fermenters or commoners. Hopefully you will have a chance to virtually appraise our results, even if the funky taste or smell is afar! We are open for new ferment hints where to go in the future.